Industrial and portable Stroboscopes and Strobe Lights by Monarch, Checkline, SKF and Extech. Reliability Direct, Inc. Your Direct Source for Reliability, Maintenance, Test & Measurement! Stroboscopes or Strobe Lights use a variable frequency flashing light to visually freeze the motion of a rotating machine shaft or other vibrating part to determine its frequency in Hz, CPM, RPM, Timing or Phase. Stroboscopes may also be triggered by a balancing analyzer to determine phase angle for adding or subtracting weights. Reliability Direct, Inc. offers a wide variety of stroboscopes for use in machinery inspection, vibration monitoring, and measuring speed (RPM), and frequency. We provide stroboscopes from leading manufacturers such as Monarch Instruments, Checkline, SKF, Extech and Ecom. 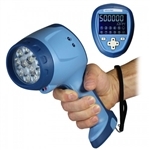 Choose from battery or AC powered units, LED Stroboscopes, Pocket Stroboscope, Phase Shifting Stroboscope, Vibration Stroboscope and Intrinsically Safe Stroboscopes. Nova-Pro 100: Designed for simple stroboscopic stop motion inspection and RPM measurement applications.The integral laser module is an optional item that can be added to make the 100 a full featured tachometer. Nova-Pro 300: Has all the features of the 100. It includes the integral laser module for tachometer mode or strobe trigger mode and adds a high contrast inverse blue LCD display with back light and touch sensitive number pad for setting flash rates quickly, ultra high intensity LED’s for even more light output, memory for up to 10 preset flash rates, input and output jacks for external sensors or pulse repeater output and NIST calibration certificate packaged in a latching carry case. Nova-Pro 300: Has all the features of the 100. It includes the integral laser module for tachometer mode or strobe trigger mode and adds a high contrast inverse blue LCD display with back light and touch sensitive number pad for setting flash rates quickly, ultra high intensity LED’s for even more light output, memory for up to 10 preset flash rates, input and output jacks for external sensors or pulse repeater output and NIST calibration certificate. Nova-Pro 300: Has all the features of the 100. It includes the integral laser module for tachometer mode or strobe trigger mode and adds a high contrast inverse blue LCD display with back light and touch sensitive number pad for setting flash rates quickly, ultra high intensity LED’s for even more light output, memory for up to 10 preset flash rates, input and output jacks for external sensors or pulse repeater output and NIST calibration certificate packaged in a latching carry case. Nova-Pro 500: Has all the features of the 300. 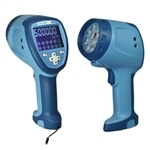 It includes the integral laser module for tachometer mode or strobe trigger mode and adds a high contrast inverse blue LCD display with back light and touch sensitive number pad for setting flash rates quickly, ultra high intensity LED’s for even more light output, memory for up to 10 preset flash rates, input and output jacks for external sensors or pulse repeater output, virtual slow motion, extra battery pack, remote laser docking station and NIST calibration certificate. Nova-Pro 500: Has all the features of the 300. It includes the integral laser module for tachometer mode or strobe trigger mode and adds a high contrast inverse blue LCD display with back light and touch sensitive number pad for setting flash rates quickly, ultra high intensity LED’s for even more light output, memory for up to 10 preset flash rates, input and output jacks for external sensors or pulse repeater output, virtual slow motion, extra battery pack, remote laser docking station and NIST calibration certificate packaged in a latching carry case. Nova Pro UV 385 LED Stroboscope combines all the features of our hand held LED stroboscopes together with Ultra Violet 385nm wavelength LED'S. Brighter and lighter than ever the new Nova-Strobe X series sets the standard for high intensity multi-function portable stroboscopes. Internal phase shifting allows the target to be jogged clockwise or counter clockwise in 5° increments. The bbx battery operated stroboscope weighs only 1.9 lbs. (0.8kg) and will run continuously up to 2 hours on a single charge. The bax stroboscope is AC mains powered (115 or 230 Vac) and will run continuously. It weighs only 1.5 lbs. (0.72 kg).